The antiquity of writing in India stretches back to the period of the Indus civilization which lasted for about a thousand years from 2500 to 1500 B.C. After a gap of over a thousand years we come across inscriptions of Asoka in the Greek, Aramaic, Kharosthi and Brahmi scripts. Brahmi was the most common script used by Asoka who ruled from 269 to 232 B.C. Brahmi inscriptions which belong to the period of Asoka have been found in Sri Lanka in rock-shelters. The language used in the Brahmi inscriptions of Ceylon and those of Asoka is Prakrit, a colloquial form of Sanskrit. Inscriptions using Brahmi characters have also been discovered in Tamil Nadu in rock-shelters and potsherds of different types, and the language used is Tamil with a mixture of Prakrit words. The earliest writings so far discovered in Tamil are written in characters which closely resemble Asokan Brahmi inscriptions. These inscriptions are said to be written in the Tamil-Brahmi script to denote the fact that it is a script closely resembling Brahmi and used for writing the Tamil language. The language of these inscriptions is a peculiar kind of Tamil and not really the classical Tamil of the Sangam poetry. 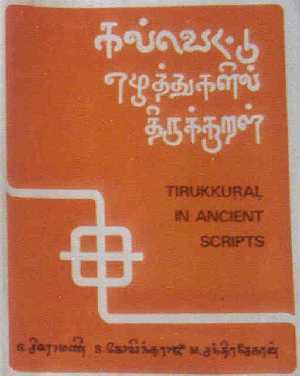 Both the modern Tamil script1 and the Vatteluthu script evolved from this parent script. No other script earlier than the Tamil-Brahmi (also called the Dhamili or Tamil) script has so far been discovered in Tamil Nadu. The Asokan Brahmi is the parent script from which all the modern Indian scripts evolved over many centuries. However there is no unanimity of opinion about the origin of this parent script. It is either an indigenous script or a script borrowed from outside the country, and some of the earlier theories were based on the similarities in shape between the Brahmi and some west Asian scripts. Some letters were similar between the scripts but there were many letters which were not similar and the sound values were often different. If the script were to be of indigenous origin then it could have developed from the Indus signs and some of these signs which resemble Brahmi characters have formed the basis for the theory of indigenous development of the Brahmi script. There is another logical possibility, viz., that the script could be indigenous but need not have evolved over centuries from a different set of signs such as the ones found in the Indus system. It is this logical possibility of the script having been designed and perfected during a fairly short period which we would like to examine. We assume that the script of the Asokan Brahmi inscriptions had not undergone any drastic change in the shape of the characters. When we put forward such a thesis a few years ago2 it was rather new but now we have scholars who are willing to admit this possibility3. When was the Asokan Brahmi script designed? Megasthenes the Greek envoy who visited the imperial Mauryan court around 300 B.C. is said to have observed that Indians did not have written books, implying that they did not use a writing system or writing was not widely prevalent. Archaeological excavations in pre-Asokan sites have not brought to light earlier forms of Brahmi; and Brahmi itself appears rather suddenly on the scene as an elegantly designed script. It is quite likely that the northern Brahmi came into usage some decades before Asokan rule -- i.e. the beginning of the 3rd century B. C. From where did the inventor get hold of so many different signs? We had proposed earlier that he possibly made use of geometrical patterns like a square with a cross on it (or a large square made of four small squares), and a circle with a vertical straight line (like the Greek letter phi), and these geometrical designs are found along with Tamil-Brahmi inscriptions. Many of the Asokan-Brahmi and the Tamil-Brahmi signs can be fitted into these basic designs. Once we accept the hypothesis that Asokan Brahmi was invented over a comparatively short period then we have to face the question of the relation between the Asokan-Brahmi and the Tamil-Brahmi scripts. They could not have been designed independently by two different groups unknown to one another and come out with more or less the same set of symbols for the same set of sounds. Either one is directly influenced by the other or there was a common source from which both Tamil in the south and Prakrit in the north borrowed. Since we do not have any evidence at the moment for such a third source we shall confine our attention to the relation between the Asokan and the Tamil-Brahmi scripts only. It is generally accepted that the influence of Asoka was felt all over India and Sri Lanka, and Asokan edicts are spread all over India except in Tamil Nadu and Kerala. It is therefore held that Tamil had no script of its own prior to Asokan period, and that either during Asoka's reign or some time later Tamil was committed to writing for the first time using a modification of the Asokan-Brahmi script. However what we wish to examine in this paper is the possibility of the Asokan Brahmi script itself having been developed from the Tamil script. In other words the first Mauryan scribe of Brahmi knew about the Tamil script and added new symbols to suit the requirements of writing Prakrit. We shall examine the hypothesis that the Tamil-Brahmi script directly influenced the designing of the Asokan script. The generally accepted theory that Tamil-Brahmi system is an adaptation of the Asokan Brahmi system has a number of difficulties, as any theory would have. With the addition of new symbols for the special Tamil letters such as l@@@a, l@@@ @a, r@@a and n@@a, Asokan Brahmi must have been fairly adequate to write the Tamil language. The difference between the long and the short medial e and medial o can be made out from the context and so also the pure consonants from a consonant-vowel combination. If the existing Tamil-Brahmi inscriptions were in fact written during the period of Asoka why is it that they do not follow strictly the Asokan system? It is widely known that the common Tamil word MA KA N was erroneously read as MAA KAA NA for decades by professional epigraphists who relied on the Asokan system to read the Tamil-Brahmi inscriptions. In other words a Buddhist monk from the Asokan capital would not have been able to read correctly the proper names and other words written in the Tamil-Brahmi script of his period. There are in fact a number of Prakrit words in early Tamil inscriptions and why did they follow a system of writing which reduced unnecessarily the mutual intelligibility between the people from the north and the people of Tamil Nadu? Alternatively one may suggest that writing was introduced into Tamil Nadu only a hundred years after Asoka. This suggestion also would lead to some other difficulties. This would mean that during the period of Asoka's time, and for a hundred years after him, his neighbouring kingdoms of the Cholas, Keralaputras, the Satyaputras and the Pandyas did not make use of writing even though writing had spread to Ceylon in the south and Mysore in the north. 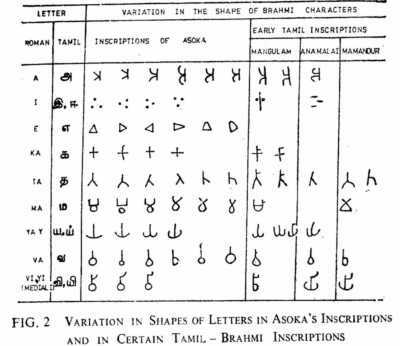 The Brahmi script of Asoka had become such a standard script for Ceylon and the southern part of India there is no reason to believe why Tamil had to follow a system of writing different from the Asokan system. We are referring to the example of the Tamil word MA KA N which would be read wrongly as MAA KAA NA if one used the Asokan notational system for reading that Tamil word. Furthermore many of the archaic looking Tamil-Brahmi inscriptions do not follow the Asokan notational system. The Mahavamsa,4 the Buddhist chronicle of Sri Lanka speaks of a monarch, King Vijaya of the fifth century B.C. having sought matrimonial alliance with a Pandya ruler. The ancient Pandya ruler is said to have sent a letter to Vijaya along with his daughter. This reference to a letter could indicate that writing existed in Tamil Nadu for many centuries before Christ. A commentator of Tolkappiyam5 speaks of the letters of the Tamil alphabet having or having been derived from forms such as the square, the circle etc. This shows that the Tamil grammarians had a theory of the origins and development of writing based on simple geometrical forms. Since it is not found in the original text there is no way of claiming much antiquity for this theory except that it could be based on an early tradition. We shall now discuss the different orthographic systems that were prevalent about 2000 years ago. For the sake of convenience we shall refer to the different systems of writing used in Tamil Nadu as Tamil-Brahmi I, Tamil-Brahmi II and the Tamil Pulli systems. We shall compare these with the Asokan Brahmi system and the Bhattiprolu relic-casket inscriptions from Krishna district of Andhra Pradesh. The existence of two orthographic systems of writing Tamil-Brahmi was first demonstrated by Mahadevan.6 In the system that we call Tamil-Brahmi I, the letter NA is distinguished from the letter N by adding a horizontal stroke at the top of the letter N (Fig.1). This vowel-marker unambiguously distinguishes the consonant-vowel combination from the corresponding pure consonant. In the word NAVAMANI, for example, the letters NA, VA and MA have the medial vowel a inherent in them. In Fig. 1, all these three letters have the vowel-marker denoted by the same short horizontal stroke at the top right hand side. The letter NAA is written as two letters NA and A and this system unambiguously distinguishes the letters with the medial long a from the letters with the medial short a. In Tamil, pure consonants occur frequently at the end of a word as well as in the middle of a word. Letters with short medial a are more frequent than letters with long medial a. A short horizontal stroke on the left side would indicate the short medial e and two horizontal strokes one on the left and the other on the right would indicate the short medial o. The short medial i indicated by a short vertical stroke at the top and the medial u by a short stroke at the bottom. The sign for ai is a double horizontal stroke on the left. The lengthening of the vowels could be indicated by adding a pure vowel as in the case of NAA in Figure 1. In Tamil-Brahmi II, the same sign is used to denote a pure consonant as well as the consonant with inherent a . For example the letter N as well as the letter NA will be denoted by the same symbol. In contrast to this, in the first system these letters would be distinguished by using a horizontal stroke to the letter NA to the top right hand side. In the second system an addition of the stroke would indicate letter NAA or N with the long medial a. Here the Tamil-Brahmi II system closely resembles the Asokan Brahmi system. In the Asokan Brahmi inscriptions which are in Prakrit, pure consonants do not occur frequently. There is a special sign called the anusvara for the letter m which is represented by a small circle, and it represents the pure consonant m. All other pure consonants are denoted by a special device. If a pure consonant like K were to be followed by a letter like YA, then Y is written below K and a compound letter KYA is formed indicating that the top sign denotes a pure consonant. There is no way of unambiguously representing a pure consonant when it occurs at the end of a word. One way of getting over the difficulty is to write the consonant as a consonant with short medial a and the correct value may be given depending on the context. This practice is not followed in any of the Tamil-Brahmi systems. The third system of writing in Tamil-Brahmi inscriptions is the Tamil Pulli system. A pure consonant is distinguished from a consonant with inherent a in the form of a small circular dot or pulli placed near the symbol. In Tolkappiyam it is stated that the pure consonant will have a dot or a pulli and the sound M could also be in the form of a pulli. This fact that Tolkappiyam refers to the anusvara is not universally accepted. The Tamil pulli system unambiguously denotes the pure consonants, the letters with short medial vowels and those with long media! vowels. The short e is distinguished from the long e by the addition of a pulli to the sign for e.
The Bhattiprolu system is similar to the Tamil-Brahmi I system. The long medial a is denoted by a longer stroke at the top right hand side which bends down (Fig.1). A sign without any extra marking would denote a pure consonant, one with a short horizontal sign at the top right hand side would denote a short medial a sign and a sign with a long horizontal stroke bent down, would denote a long medial a sign. This system can be viewed as an improvement over the Tamil-Brahmi I system. The Asokan Brahmi system is closer to the Tamil-Brahmi II system. We wish to put forward the hypothesis that Asokan Brahmi is a close adaptation of the Tamil-Brahmi script. This hypothesis is not startlingly new. In 1954 T. N. Subramaniam proposed that Brahmi was originally meant for a language like Tamil.7 However we shall not follow the main lines of his arguments here. We wish to propose that the Tamil-Brahmi system I belongs to the pre-Asokan period and the Asokan Brahmi is an adaptation and elaboration of that system. Is there any evidence to support such a hypothesis? First we note that there are fewer symbols in the Tamil-Brahmi script compared to the Asokan Brahmi script. It is quite plausible that signs other than the ones used by Tamil grammarians could have been used along with the letters of the Tamil Brahmi script, from the earliest times. There do exist some Asokan Brahmi symbols which could be thought of as resulting from an elaboration of certain Tamil letters For instance the letter PHA is obviously an elaboration of the letter PA and it is obtained by adding a cur! to the PA sign. The fish-shaped form of MA used in Asokan Brahmi inscriptions could be treated as a form evolved from the Tamil form for MA (Fig. 2). Other things being equal a more elaborate script is a later development of a less elaborate one. As we have described earlier, there exist three systems of writing followed in Tamil-Brahmi inscriptions. The Asokan Brahmi inscriptions, however, follow a single orthographic system which is different from the Tamil systems as well as the Bhattiprolu system. Here we wish to make use of a principle followed in the Life Sciences for fixing the original home of a plant or an animal which occurs over a vast area. When the same kind of plant is found all over the world, certain criteria are used to fix the original site from which the plant eventually spread. The first objective criterion is this. If many related species are found in the wild in one region of the world then that region is reckoned to be the original home of the plant even though it may be found extensively in other parts of the world. If we apply this principle to the area of ancient scripts then Tamil Nadu would be original home of the Brahmi script since a variety of systems were in use for writing Tamil. One may wonder whether this methodology is applicable to the area of scripts. We can verify it by looking at the Grantha script used in Thailand.8 The original home of the Grantha script is southern India and many varieties of that script are found there. We conclude that the objective scientific principle is also applicable to ancient scripts. Another objective criterion used in the Life Sciences is to assign an area as the original home of a plant if that area harbours a more primitive and wild variety of the plant in question. For instance, chillies were introduced into India less than about 500 years ago. Wild chillies are found in the American continent, and South America is the original home of the chilli plant. Let us apply this objective principle to the field of epigraphy. Let us once again take the example of the Grantha script from Thailand. The original home of the script is Andhra Pradesh and Tamil Nadu wherein we find the earlier forms of that script. Let us apply this principle to the study of the Brahmi script. We shall show that the Tamil-Brahmi I system is more primitive than the Asokan system. In the former system every consonant sign stands for a pure consonant. If a vowel were to follow a pure consonant it is represented either by printing an initial vowel sign next to the consonant or by modifying the consonant sign by the addition of a short stroke or two which represent an appropriate medial vowel sign. For example consider the case of the consonant K which is written in the form of a cross. A cross with the addition of a horizontal stroke at the top right hand side will represent KA, a stroke at the bottom right hand side will represent KU, a stroke on the top left hand side will represent KE and so on. The same principle is used for all the vowels and vowel a does not get any special priority over other vowels. This system is more logical and more basic than the Asokan system. We recall that in the Asokan Brahmi system, a cross sign stands for KA or K+A. A vertical stroke on the top right hand side makes it KI or (K+A)-A+I. 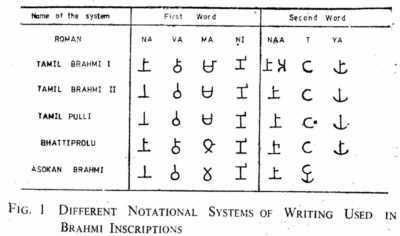 The Asokan system, therefore, is less primitive and less logical than the Tamil-Brahmi I notational system. The fact that there exists a system of writing in Tamil which is more logical and more basic than the Asokan system supports our hypothesis that Tamil-Brahmi is a little more ancient than Asokan Brahmi. The dating of the Tamil-Brahmi inscriptions is full of uncertainties. The only dated Brahmi inscriptions of significance are the Asokan inscriptions of the third century B.C., the Arikkamedu graffiti on potsherds9 of the first and second centuries A.D and a silver coin10 of Vashishtiputra Sri Satakarni of the second century A D. The Arikkamedu dating is based on archaeological methods which make use of Roman pottery which can be dated to within a few decades. Some inscribed potsherds have also been reported from Uraiyur11 and these are assigned to the end of the first century or the beginning of the second century A. D. The Arikkamedu inscriptions follow the Tamil-Brahmi II system whereas the Uraiyur writings follow the Tamil-Brahmi I system. The Satakarni coin follows the Pulli system. In some inscriptions there is some kind of mix-up of more than one system. All .the three systems seem to have existed side by side. Many scholars tend to date the Tamil Brahmi inscriptions on the basis of Paleography or the study of the shape of (ancient) letters. A reliable paleographical scheme for the study of Tamil Brahmi inscriptions is yet to be established. In the Ceylon inscriptions it has been found that there is no uniformity of script in the early inscriptions and it has not been possible to formulate a paleographical scheme to be used for dating inscriptions of unknown authorship.12 As a matter of fact paleographical methods are not dependable enough for determining the dates of early Tamil-Brahmi inscriptions. Even in Asokan inscriptions (Fig. 2) there is a lot of variation13 in the shapes of letters inscribed by different individual scribes. In Fig. 2 we see a variety of shapes in which the letters are depicted in the inscriptions of Asoka. The symbol used for initial i is often a group of three dots. Tamil-Brahmi inscriptions use a group of three horizontal strokes which, I believe, is an earlier form of the letter which can be derived from the geometrical pattern of square with a cross. The triangle sign for initial e is also found in Tamil-Brahmi inscriptions. In a cavern at Muthupatti14 the pyramidal form appears and it could be the earliest form. The sign for k is written in more than one way. The various shapes of the letter ta (ta as in Tamil) includes many shapes which are found in Tamil-Brahmi inscriptions. The Asokan symbol for ma appears to be derived from the corresponding typical Tamil form. The different forms of ya are also found in Tamil-Brahmi inscriptions. In Asokan inscriptions the medial i is represented in more than one way. Such a wide range of variation in the shapes of letters in the inscriptions and the similarity between some of the Asokan letters and the Tamil-Brahmi letters should lead scholars to take a cautious approach towards dating early Tamil inscriptions on the basis of paleography. The significant changes in the shapes of Tamil-Brahmi letters have yet to be successfully identified. The difference between the period characteristics and the scribal characteristics has yet to be established. The sign for medial i which is a short vertical stroke at the top of a sign, evolved over centuries into the form of a cap. However, even in some Asokan inscriptions the pure shape of a vertical line attached by a horizontal stroke is not strictly maintained. If such a feature were to be used to date a Tamil-Brahmi inscription it could lead to erroneous conclusions. The recent discovery of an inscription of Adiyaman Nedumananji at Jambai village brings home the difficulty. The first part of the inscription is very similar to Asokan inscriptions. From literary sources we know that Atiyan was a contemporary of Ceraman Peruncheral Irumborai. An inscription of Ceraman's son is known to exist at Pugalur15 near Karur and this inscription must be only a few years or decades later than the Jambai inscriptions. However if one were to depend upon paleographical methods, the Pugalur inscription will appear to be more than a century later than the Jambai inscription. Atiyaman is believed to have lived in the later part of the second century A. D. but his inscription is more similar to the Asokan inscriptions of the 3rd century B. C. than to the legend on the Satakarni coin of the second century A. D. The Atiyaman inscription has brought to the forefront the difficulties and uncertainties in dating the Tamil-Brahmi inscriptions. One is therefore left mainly with literary sources to fix the dates of inscriptions and the literary sources themselves are not always free from interpolations. Silapathikaram has a couple of references to king Gajabahu of Sri Lanka. One appears in the introductory passage where many kings are described as offering sacrifices to Kannagi who had already been deified as a goddess. The second reference is towards the end of Silapathikaram where Gajabahu is described in the company of Senguttuvan. Mahavamsa is silent about Gajabahu's visit to India but some scholars have accepted the authenticity of this account in Silapathikaram for establishing Gajabahu-Senguttuvan synchronism. These and perhaps other materials are used to date the period of Karikala Chola and Atiyaman Nedumananji to the second century A. D. However the dates proposed for the sangam period on the basis of earlier historical studies are often at variance with the dates proposed by those who rely heavily on Tamil language and literature. It seems to me that the Senguttuvan-Gajabahu synchronism is not based on strong corroborative evidence and once this synchronism is given up, I wonder why Atiyaman Nedumananji cannot be treated as a contemporary of Asoka or at least placed in the first or second centuries before Christ. With the available data at our disposal it is therefore difficult to get a clear picture of the origin of writing in Tamil Nadu. We shall however propose a tentative scheme of development as a hypothetical alternative to the already existing theories. In the first stage the Tamil-Brahmi script is invented and used for writing in Tamil Nadu during the pre-Asokan days. The script could be alternatively called Dhamili or Tamil. All the letters might have been invented in toto or some more Tamil letters such as l@@@a, l@@@ @a, r@@a and n@@a and some non-Tamil letters could have been invented towards the end of the first stage The first orthographic system would have been in use. In the second stage the Tamil letters reach the courts of the Mauryan kings and the Tamil script is adapted to write Prakrit language. New signs are added and these could have been devised using the same principle as the one used by the original inventors so that there is not much difference between the new and the old letters. Special Tamil characters which are not of use for writing Prakrit are dropped. During the reign of Emperor Asoka, the Brahmi script is spread far and wide up to Sri Lanka. The already existing Tamil system gets influenced by the Asokan system and the Tamil-Brahmi II system which is akin to the Asokan system is slowly accepted in Tamil Nadu. Both the systems operate side by side. Due to the mixing of the two systems, consistency of systems is not strictly maintained in many inscriptions. The Pulli system can be envisaged as an improvement over the second system in which a pulli is used to mark pure consonants. The Pulli system coexisted with the other two systems and the Anaimalai inscription16,17 is an example of the Pulli system. This scheme assumes that the pulli system came after the second system in order to accommodate the theory that Asokan writings influenced the Tamil notational system. It is quite conceivable, however, that Tamil was not very much influenced by the northern Brahmi inscriptions and the Pulli system could have preceded the second system as an alternative independent notational system. The Tamil-Brahmi II system, in that case, would be a later development of the Pulli system and the pulli could have gone out of use as it happened in the medieval period. The Pulli system is described in Tolkappiyam as the norm. In Tolkappiyam every vowel is treated as uyir or soul and every consonant as mey or body. The same soul could enter different bodies and form uyir mey or body with soul. A single soul or uyir could exist by itself but a body or pure consonant could not. Thus a theory for the letters of the Tamil alphabet existed at the time of Tolkappiyar and it reflected the contemporary metaphysical system which included the belief in the transmigration of souls. The Bhattiprolu system can be viewed as an improvement over the Tamil-Brahmi I system and it also existed side by side with the other systems. We are not in a position now to establish with certainty the nature of the origin and development of writing in Tamil Nadu but the picture may become clearer in the future when new inscriptions are discovered. What is clear, however, is that two systems of Brahmi as well as a third Tamil Pulli system had existed side by side during the early period. A large proportion of inscriptions that have been discovered so far, is in the Tamil-Brahmi II system. The earlier theory that writing in Tamil Nadu developed after Asoka does not fit in well with the available data and therefore we have proposed an alternative theory which needs to be examined further for its validity. I wish to thank Dr M. Lockwood. for fruitful discussions and for going through an earlier draft of this paper, and Mr. S. Govindaraju for preparing the diagrams. 3 S. P. Gupta and K. S. Ramachandran (Eds. ), The Origin of the Brahmi Script, Delhi, 1979. 4 W. Geiger, The Mahavamsa or the Great Chronicle of Ceylon, Colombo, 1960. 6 I. Mahadevan, Tamil Brahmi Inscriptions, Madras, 1970. 7 T. N. Subramaniam, South Indian Temple Inscriptions, Vol. Ill, Part II, Madras 1957, p. 1609. 8 Neelakanta Sarma, Textes Sanskrits et Tamoul de Thailande, Pondicherry, 1972. 9 R. E. M. Wheeler, "Arikamedu: an Indo-Roman trading station on the east coast of India", Ancient India, July 1946, p. 109. 10 R. Nagaswamy, "A bilingual coin of a Satavahana", Seminar on Inscriptions, Madras, 1968, pp. 200-202. 11 T. V. Mahalingam, "Inscribed potsherds from Alagarai and Uraiyur", Seminar on Inscriptions, Madras, 1968, pp. 42-43. 12 S.Paranavitana, Inscriptions of Ceylon, Vol., I 1970, pp. xxi-xxii. 13 E. Hultzsch, Corpus Inscriptionum Indicarum, Vol. I, Oxford, 1925. 14 Gift Siromoney and Emmanuel Jebarajan, "A Tamil-Brahmi Inscription from Madurai Region", STAT-44/80 (Mimeo), Tambaram, 1980, p. 4; paper presented at the Sixth Annual Congress of the Epigraphical Society of India. 15 I. Mahadevan, "Corpus of the Tamil-Brahmi Inscriptions", Seminar on Inscriptions, Madras, 1968, pp. 57-73. 16 Emmanuel Jebarajan and Gift Siromoney, "On the occurrence of the Pulli in the Tamil-Brahmi inscription of Anaimalai", New Dimensions in the Study of Tamil Culture, Palayamkottai, 1978, pp. 8-12. 17 T. V Mahalingam, Early South Indian Paleography, Madras, 1974.